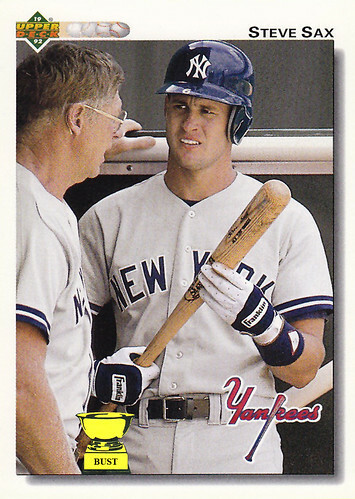 Steve Sax's train of thought from 5:10 to 5:12 p.m., June 22, 1991: "Wow, he just doesn't shut up, does he? ... Whose idea was it to let Mattingly invite his grandpa to watch the game from the dugout, anyway? ... Oh, God, I don't want to hear about the prostitutes you found in Seoul during the Korean War. That's just gross. ... Really? You're talking about how great Studebakers were? Somebody shoot me. ... Whew, I'm on deck. Hey, come on, let me past. No, I don't want to hear about how you met your second wife at your first wife's funeral. That's creepy. Come on! Should I just push him out of the way? Oh, shocking, Pat Kelly just popped out. But now I'm up — that's it, I'm pushing past. Look out — oh crap, he fell. I think he broke a hip. Well, this could be worse. I could be playing for the Indians."